A couple of weeks ago, myself and our good friend Orla decided to take on the role of ladies that lunch. Doing it in style, we headed to the Burrendale Hotel and Spa for some delicious Afternoon Tea, and we certainly were not disappointed. What followed was a week’s worth of giggles and what can only be described, on my own part, as a feeding frenzy! The food itself and the service were fantastic, and great value too. It is fair to say, however, that our eyes were bigger than our bellies, and the Burrendale staff equipped us with two pretty doggy bags to take home with us. As you can imagine, it didn’t last long in our house as Nial went in for the kill as soon as he saw it. 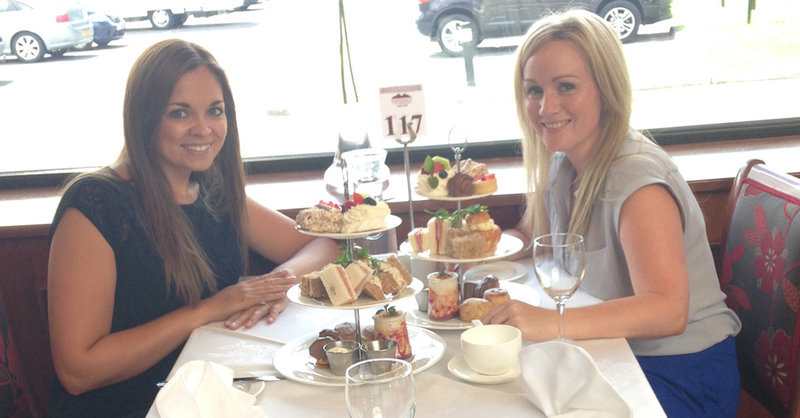 Read on to see our review of afternoon tea in the Burrendale Hotel, Newcastle. We both sat down to fantastic sunny views of the Mourne Mountains and were greeted to a three tiered stand of goodies each, along with a tea or coffee of our choice. Our eyes lit up, it looked so beautiful, and we didn’t have to share any of it!! We started with the middle tier which were a selection of delicate finger sandwiches and one freshly baked bun with a ‘Free Range Egg & Onion’ filling. Each finger sandwich was a different flavour and they all tasted fantastic, the fillings were ‘Free Range Irish Chicken & Bacon’, ‘Tuna, Onion & Scallion’, and ‘County Down Ham & Mustard’. After clearing the middle tier we moved on to the bottom tier which had mini plain and fruit scones with pots of Devonshire clotted cream and homemade strawberry preserve. There was also a generously sized cream-filled chocolate profiterole and a jar with a sort of raspberry and peach flavoured cream. It was summery and fantastic! The top tier had even more goodies, a chocolate covered strawberry, a salted caramel macaroon, a mini meringue nest with cream and fresh fruit, a chocolate covered sponge and a strawberry glazed tart filled with crème pâtissière. Each bite was delicious!! 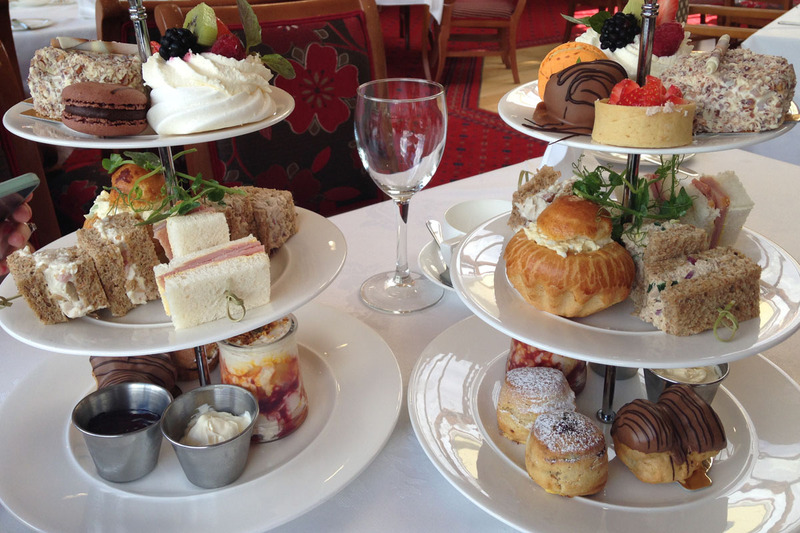 We think that the Afternoon Tea in the Burrendale is hard to beat, and excellent value! It’s definitely worth trying but you are advised to book to save any dissappointment. 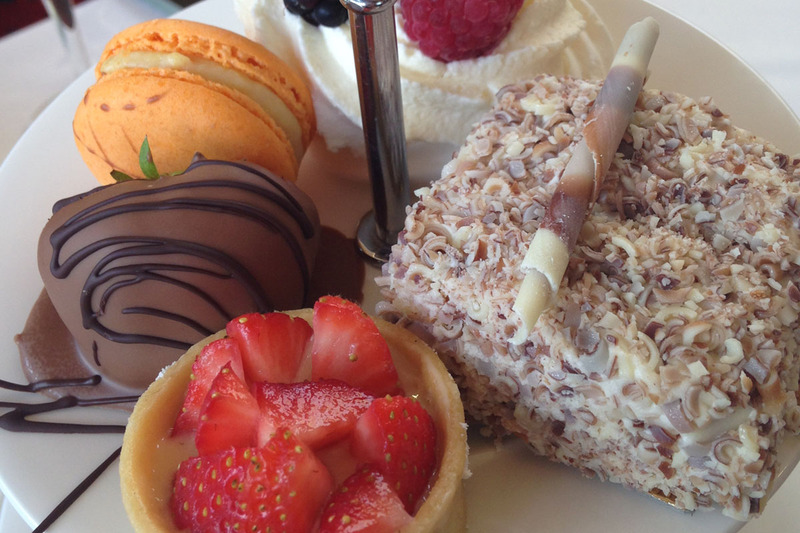 Have you had Afternoon Tea in the Burrendale? Why not share your experience with us by commenting below or on our Facebook and Twitter pages.